Newly engaged? Still looking for the perfect plus size wedding dress to say I do? Ready to ‘say yes to the dress’ but not ready to break the bank? We’ve got 20 wedding dresses under $500! Thank us later! Yes blushing brides who are about savings coins, we see you! Who said that you have spend an arm, a juicy thigh, and your first born child in order to look beyond fabulous on the day you commit to spending the rest of your life to your beloved?? Certainly not I! 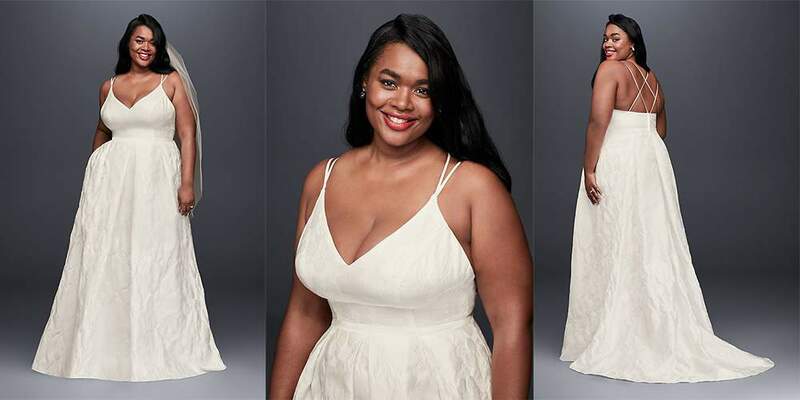 Plus Size Bridal Gowns have come a long way since my first and second (judge your mama!) weddings. I was a plus size bride that didn’t want to spend more than $300 on a dress and needless to say, my option were dry. But designers are not only catering to the budget conscious but to the curvy gals as well! We get it. You want to invest in your marriage and not your wedding. We hear you girl!!! Check out our picks! Which Dress Will You Be Saying “Yes” To? Set your low, high and mid range budget. This will give your pockets an opportunity to stretch a little bit more as your eyes see all the bridal candy out there. Have an accountability partner for your budget. Yes, get someone that will be like, “Uh, hey girl. That’s cute buuuuuut you’ll blow your budget with that one there.” Accountability = love. Know what styles fit your body type. Have an apple shape? Try out a mermaid style that will offer some balance. Pay no attention to the actual size. This can be disheartening if you’re a numbers gal. Pay attention to how it fits and makes you feel when wearing it. Alright ladies! It’s time for you to get to shopping! What’s your favorite style of wedding gown? See any here that you’d say yes to? Plus Size at Coachella: We Came, We Saw, We Conquered! WHERE IS ALL OF YOUR CONTENT?!?!?!?!?!?!?! ?